Cecilia Baah Danso, top seed of the national table tennis team, the Black Loopers, is in Nairobi, Kenya, to participate in the Africa Top 16 Table Tennis Championship. The championship is under the auspices of the African Table Tennis Federation (ATTF) to select the best female table tennis player on the continent. It also forms part of preparations towards the 2018 Commonwealth Games in Gold Coast Australia in April, by the military officer. Cecelia told the GNA Sports that, she is well prepared and focused on the competition, as she was keen on improving upon her rankings on the continent and the global level as well. 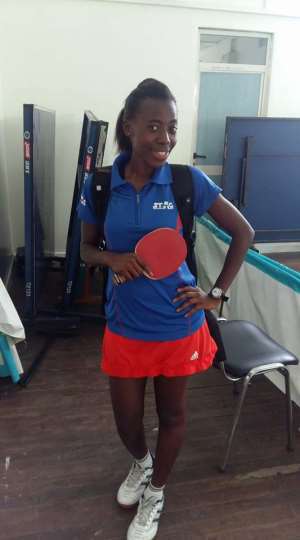 Cecelia, who is one of the two female players selected by the Ghana Table Tennis Association (GTTA), said her ultimate aim was to make the grade to the next Olympic Games in Tokyo, Japan. She expressed appreciation to the GTTA and the Ghana Olympic Committee (GOC) for their support.